Portable sound anytime, anywhere! 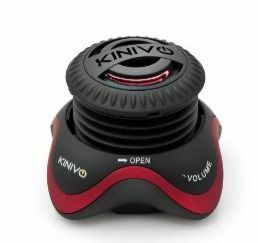 The Kinivo ZX100 Mini Speaker is a cute little speaker that produces big sound for its size. With a short audio socket that is conveniently hidden underneath, it’s easy to plug into your iPod, iPhone, MP3 player, CD player, or laptop, and it has the capability to connect multiple units to arrange a “surround sound” experience. USB rechargable and long-lasting, on your next outing to the beach, pool, picnic, or camping, the Kinivo ZX100 Mini Speaker can’t be beat!